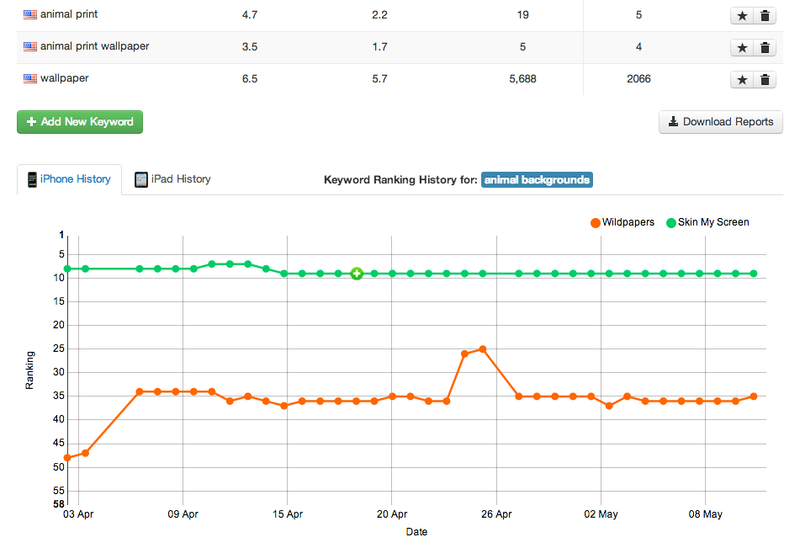 We just discovered an amazing tool for ASO (App Store Optimization), a website called App Store Rankings. Any and all developers looking to optimize their keywords and rank higher in searches need to check this site out. It not only tells you how many people are searching for a particular keyword, but it also lets you know how difficult it is to rank in the top search results for that keyword as well. It can even give you the keywords for competing apps, which by itself can be invaluable. Seeing as how 63% of all users find apps via the search function on the App Store, having the right keywords can make or break an app. 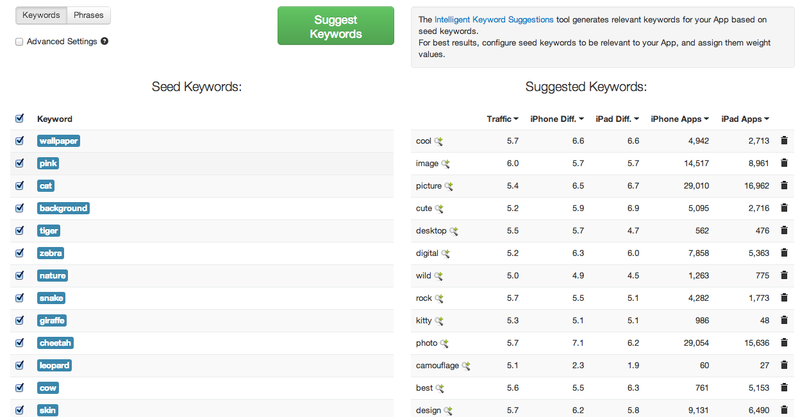 You can put in a keyword or phrase and it will tell you how it will rank in searches. For the phrase “animal backgrounds,” Wildpapers ranks in the mid-30s in searches (users will will have scroll past ~30 apps to reach Wildpapers, not the greatest). You can also compare rankings to competing apps as well. In this case, Wildpapers is being juxtaposed against Skin My Screen, which ranks significantly and consistently better. This tells you how the app ranks in a particular category and presents the history of its ranking in a nice graph. In the orange we have the rank history of Wildpapers and in the green, Skin My Screen. This feature is perhaps my favorite. Keyword Spy tells you the keywords of competing apps and then shows you which of those keywords you share with those apps. Here we have the keywords of both Wildpapers and Skin My Screen and in the middle, the shared keywords. Another invaluable feature, Intelligent Suggestions takes keywords you used for your app and gives you alternative keywords. 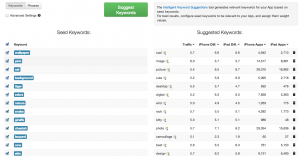 It also tells you how much traffic those alternative keywords get and how difficult it is to rank for those keywords for both the iPhone and iPad. We discovered several keywords we would never think of using for Wildpapers this way. For instance, the keyword “bg” (which I’m assuming is an abbreviation for “background”) gets a significant amount of traffic and has very little competition, something we would never have known without Intelligent Suggestions. Keyword optimization is the most cost-effective way to drive more downloads to your app. 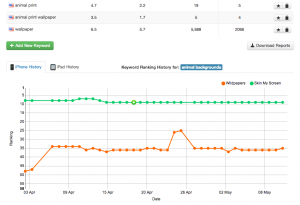 App Store Rankings takes the guesswork out of this and has become an indispensable tool to our own ASO efforts. ← Camopapers now available for iPhone!